If you are the owner or part of project management in a particular business, then you should know that there will come a time when your company is going to accept new hires. Whether it is because you need to have a position that needs to be filled or you need more people to handle certain tasks, you have to make sure that you gather all the necessary information from the people that you are going to hire. 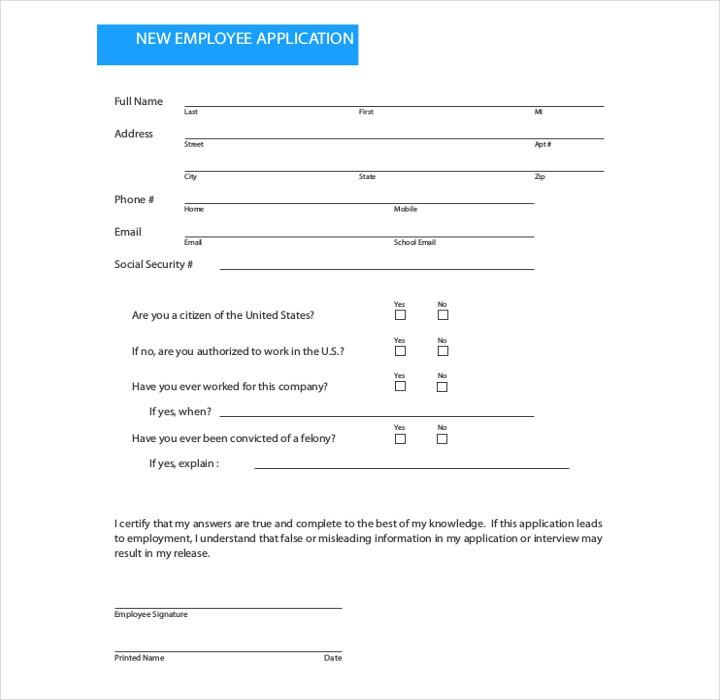 One of the easiest ways to get information from potential new hires is through the use of employee application forms, and this article is going to teach you how to fill out any job application for any company that you wish to apply for. Whenever you apply for a job, you are usually asked to complete an employment application form. 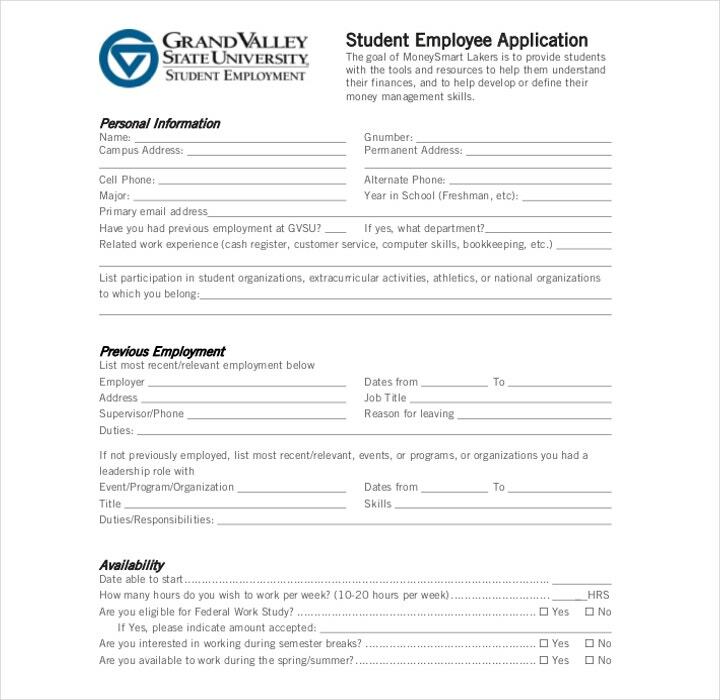 You may be asked to fill out this document even after you have submitted your resume and your cover letter. With it, your possible employer will have a record of your personal and employment history which is verified and signed by the applicant. You also have to make sure that whatever information you put in the sample application form contains no errors. 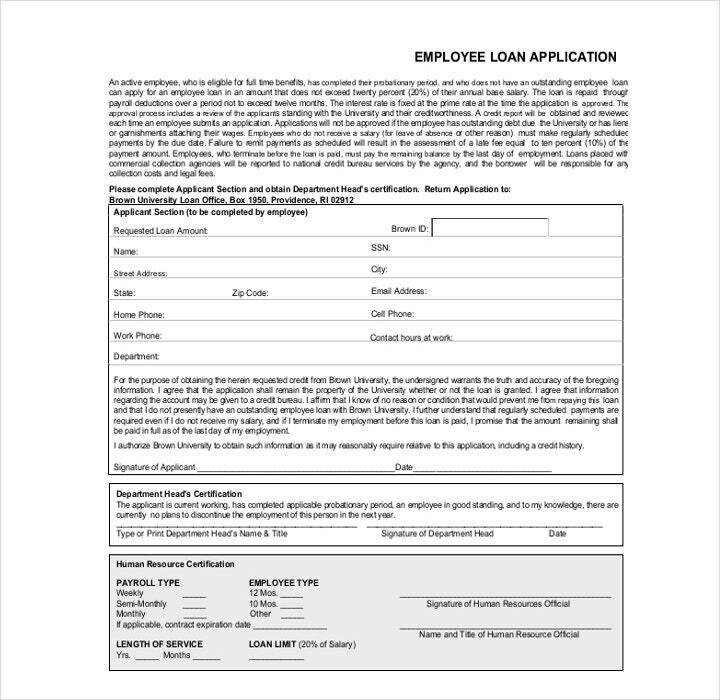 To help you with this, here are some tips and suggestions that will allow you to complete your application form template as well as make a great impression on your future employers. You will need your resume format or a list that contains all of your education and employment history to make sure that you are putting in the correct information. Whatever you placed in your resume must perfectly match whatever you have written in the sample job application. You would not want your future employer to see any discrepancies in your application now, would you? 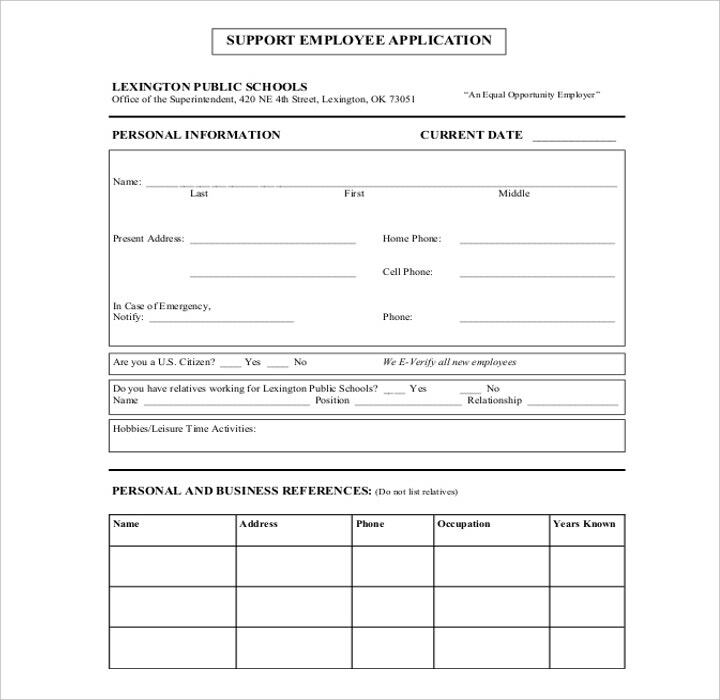 Go on the Internet and find yourself a job application template that you can download and use for practice in filling it out. This way, you can make sure that you have all of the information that you need well ahead of time. Practice filling it up so that it will not take you such a long time during the day you have to fill out an actual one. 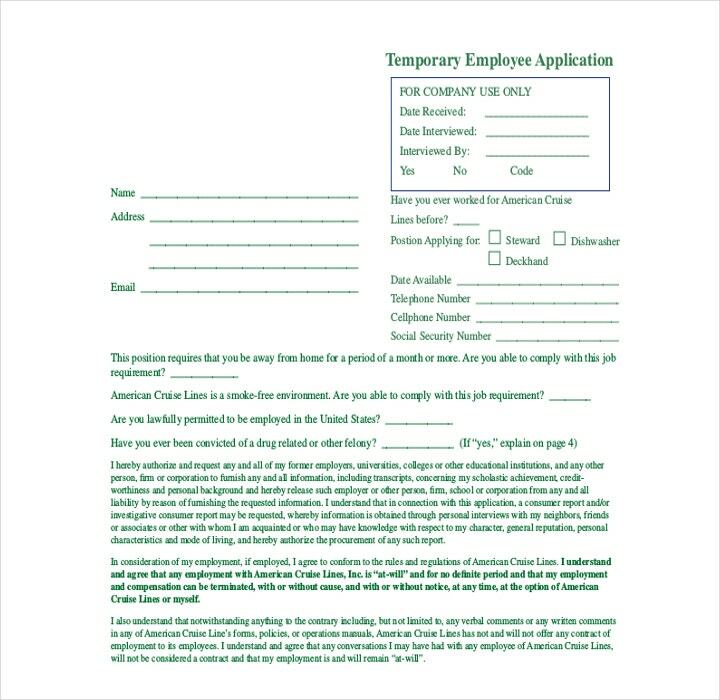 If you are trying to apply for a position in-person, then you can ask for the job application form template. 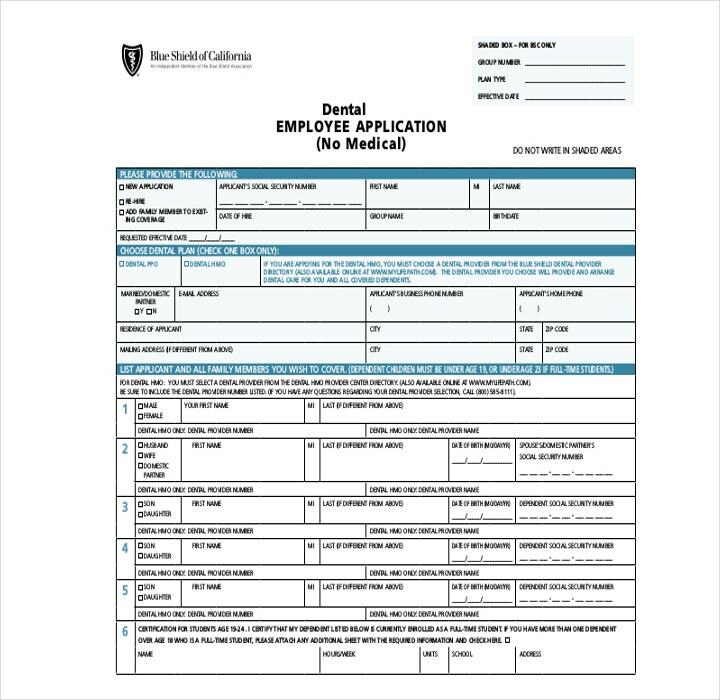 You can either take it home with you so that you can make sure that you fill it out completely, or you can do it in the location you may be required to fill the form from. All you have to do is take your time and guarantee that all of the information that you have written down is accurate before you hand it over to the company’s Human Resources or any person with authority. First impressions are very important in the business world. Before your employer is even going to talk to you, he or she may just judge you based on the way you dress. So when you decide to drop by and pick up or fill out an employment application form, then make sure that you are well dressed. You may just find yourself in a situation where you will be talking to the manager so it is important that you look as professional as possible. This can also be helpful in the event that you get an on-the-spot interview. 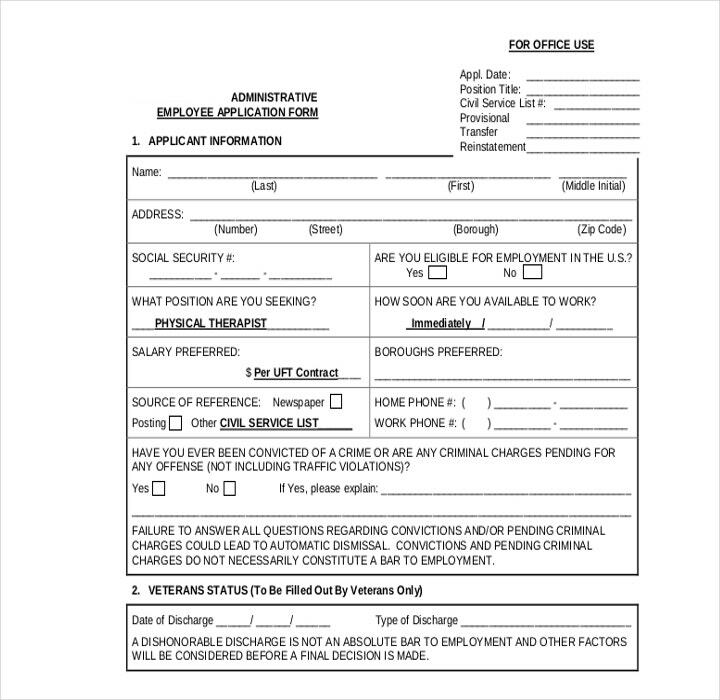 There are a lot of companies that allow you to fill out their online application forms. The reason why so many companies are doing this is that it is so much more cost-effective and it saves a lot of time for both parties. A lot of companies do not even make use of physical job applications anymore. 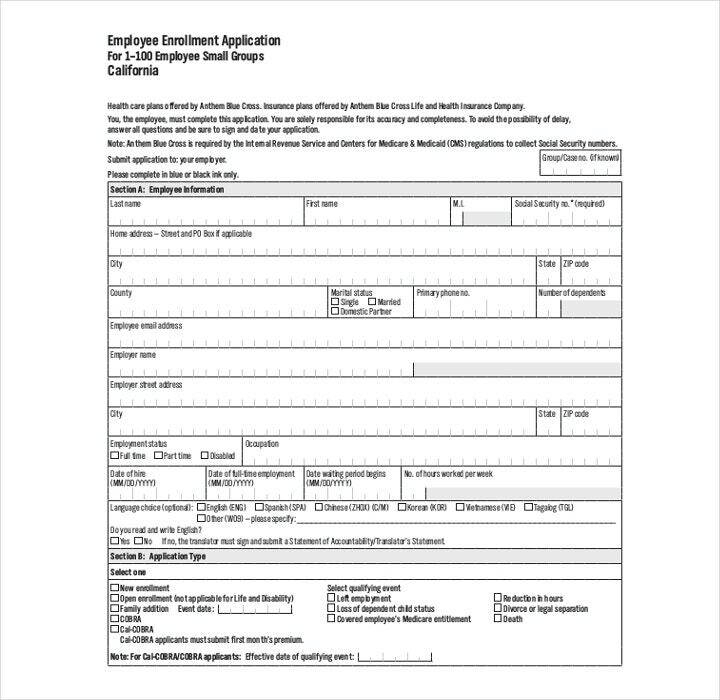 Just go through the sample application to see what you are going to have to fill out to guarantee that everything is ready before you submit the form. Make sure that you follow the instructions when you fill up either online or paper job application. You can check the business’ website or the fine print on the job application form for the instructions. One of the main rules that you have to remember when it comes to completing a job application is that you need to follow all of the instructions. Read the instructions carefully before you decide to send your simple application. Employers would much rather have an employee who is able to accurately and truthfully present information rather than those who cannot even follow simple instructions. There are even a lot of companies that will not accept any incomplete applications, so that means you have lost your chances before you even try. Just make sure that you have not missed anything out and double check your form. A lot of companies test applicants for employment to determine whether they are a good match for the position that they are applying for. Any company that conducts pre-employment tests are seeking those applicants that can match their hiring criteria as well as those that may have potential. Ask for any advice on taking employment tests and review them. This will make it so much easier for you when the moment comes that you will have to respond to any employee-related questions that you are asked. Some companies may require you to take a drug test to make sure that nothing can prevent them from hiring you. The title of the position that you’re applying for. Applicants that have researched the company that they wish to apply for are always trying to make a good impression. Go to the company’s website and give it a thorough look. Find out as much as you can about the organization and the projects that it is currently conducting and find out what the competition offers. You can even go to the company’s social media page (assuming that the company has one). Whatever knowledge you gain from this is something that you can use in your application form. There will be a section in the blank job application where you will have to input all of your academic and employment histories. However, when it comes to answering competency-related questions or writing a personal statement, then it is totally up to you on what you want to put in it. It is important that you go through the job description and person specification carefully. This is because it will outline exactly what skills and experience the employee are looking for and you should emphasize these in your application. Give specific examples of the kind of skills and experiences you have gained and how you used them in your work. Avoid being vague and do not waste the employers’ time by writing down any skills that are not relevant to the position that you are applying for. If you do not show any personality, then your application form is going to fall flat. You want to give the employer an idea of the kind of person that you are like so try to inject some personality into your answers. Do not just talk about your academic and employment history. Try to find ways for you to be able to include information about your other interests. For example, you can make references to any extracurricular activities that you have taken up that allowed you to gain the necessary skills for the job. It is best that you also show that you can get along with a variety of people. Employers are always looking for those employees that catch their interest, so try to ensure that your job application grabs their attention. There are a lot of things that you should avoid at all cost if you want to get to the interview stage. For example, you should never copy and paste any of your previous answers from other sample job applications that you have already completed. Always be specific, tailor your answers to the company that you are applying at, and the skills and experiences that are outlined in the job description. Make sure that you fill up all of the required sections of the application form. This should not be a problem if you are filling one online as these usually do not allow you to move on to the next step unless you have filled up all the required sections. And remember that honesty is always a must. Employers are going to check the accuracy of whatever information you have provided. So any form of exaggeration of your skills and experiences will most likely come back to haunt you sooner or later. Do not miss out on this perfect opportunity to sell yourself to your employer. Do not be shy about what you have achieved and do not be too modest by not mentioning any of them. Include anything that you have accomplished in the job application that is relevant to the position that you are applying for. Talk about your passion for the role or the department that you were assigned to. Discuss all of the experiences you have gained during your schooling, on the internships and placements during your part time-job, voluntary work, or even at your university club or society. If there is anything that is relevant to the job description, then make sure to add it. You want to come across as someone who is confident, so make sure that the majority of your answers are positive. Instead, just try to keep it as short and simple as possible and cut straight to the point. What this means is that all you have to do is state how you meet the requirements of the role and why the employer should choose you. Spend a lot of time in checking your application as you would not want to embarrass yourself with grammar or spelling errors. You can ask help from any of your friends or family members to see if they can point out any mistakes that you may have missed. Only send the form or click on submit if you are sure that you have checked everything that needs to be seen to and if you are happy with the responses to every question. If you would like to learn more about this topic, such as how to organize general employment application forms, then go through any of our other available articles to give you the information that you need.